I’m not sure where the idea came from. Maybe it was a article in a travel magazine. Perhaps it was a TV documentary. Whatever the reason, when it came to choosing a destination for a recent trip, the answer, at least for my wife, Maureen and I seemed obvious - Albuquerque, New Mexico and the International Hot Air Balloon Fiesta. The International Hot Air Balloon Fiesta is the largest gathering of hot air balloons in the world. 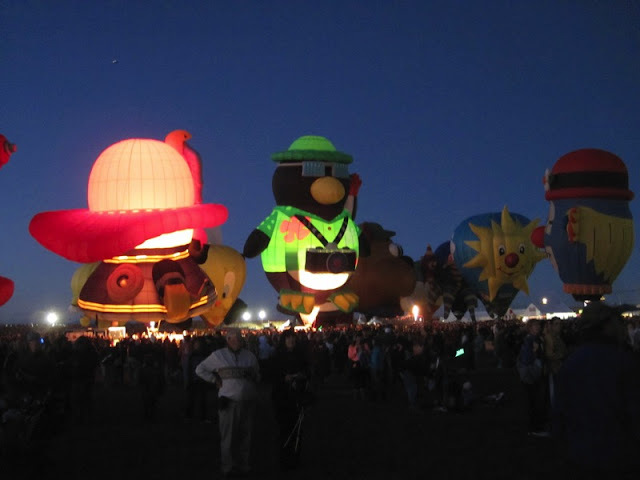 For nine days in early October (two week-ends and the week in between) hundreds of balloonists and thousands of spectators flock to Albuquerque, New Mexico’s largest city to take part in this amazing event. Not bad for a get-together that began in a strip-mall parking lot back in 1972. 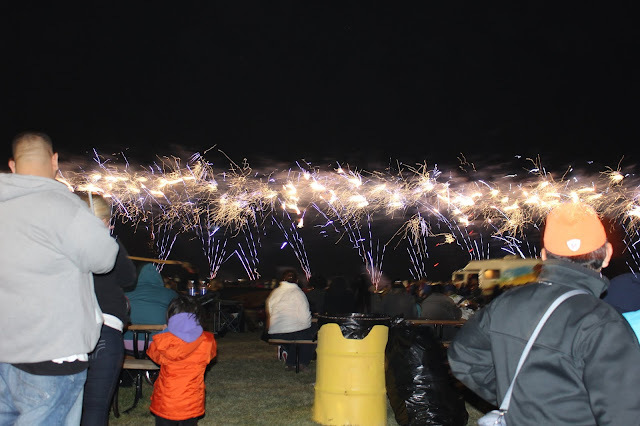 From those humble beginnings, the Balloon Fiesta has become so large and is so well attended that it now occupies a permanent site on the northern edge of the city, close to I-25. The site encompassed a huge launch field, a number of administrative buildings, a commercial area, a hot air balloon museum and a RV park. That’s right, the Balloon Fiesta has it’s own RV park – sort of. 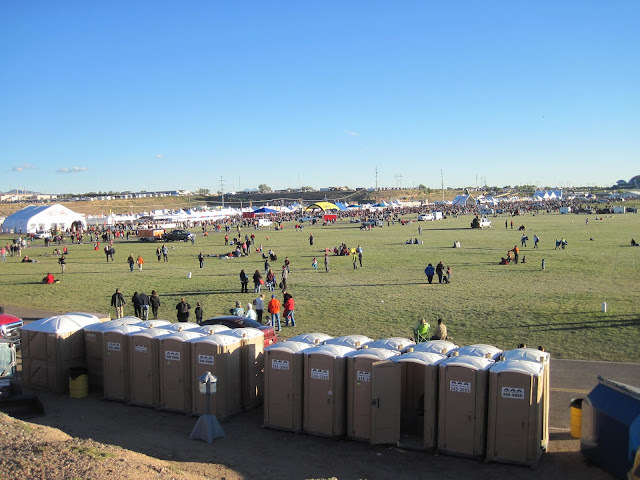 As a Balloon Fiesta novice, the first thing I discovered was, "book early". Accommodations such as hotels, motels and RV parks are snapped up months (in some cases, years) in advance, forcing would-be attendees to find lodgings in communities like Santa-Fee, 60 miles away. While the event itself takes place over 9 days, the best I could get was a spot in the Balloon Fiesta RV park for the last 3 days. For two first time attendees who had no idea what to expect this seemed like the best option. The park was adjacent to the launch field and all the action yet also relatively close to downtown. Location however, has its price and in this case it wasn’t cheap. Rates ranged from $35.00 per night dry to $175.00 for a deluxe spot overlooking the launch field. A serviced site (water and 30 amp electricity) went for $75.00 a night. Sewer needs were handled by a vacuum truck – for an extra charge. Wifi and cable TV on the other hand weren’t extra because they weren’t available. Oh well, who wanted to watch the six o’clock news or update their Facebook status when one of the most amazing spectacles on the planet was happening near by. To be fair, these rates may have seemed somewhat excessive however, they differed little from the fees charged by other local RV parks. Apparently, more than balloons went sky-high during “balloon week” (as the locals call it). While my wife and I considered ourselves lucky to have snagged a reservation, we had second thoughts when we arrived at the park. It was little more than a barren, gravel lot with not a tree, shrub or even blade of grass to be found. Temporary electrical and water lines were strung in all directions and individual sites were very cramped. Apparently, the “park” was used only during balloon week and reverted back to an empty lot once the event was over. What the park lacked in amenities, it more than made up for in location. The balloon launch field, where all the “action” happened, was just a short walk away. If walking wasn’t an option, a free shuttle bus was available. It didn’t take us long to realize just how valuable this close proximity really was. On our first visit to the launch field to take part in the Friday evening events, Maureen and I witnessed some of the worst traffic congestion and gridlock we’ve ever seen. Even though it was the Friday of the final week-end of the Balloon Fiesta, the volume of vehicles trying to access parking was enormous, overwhelming the police, traffic marshals and road system. As we walked by the long lines of cars barely inching their way forward, my wife and I were enormously grateful that we weren’t caught up in the chaos. Admission to the launch field for the Friday evening event was $10.00 per person. In fact, admission to all the events, morning or evening, week-day or week-end, was $10.00 per person. Kids, 12 and under were admitted free. 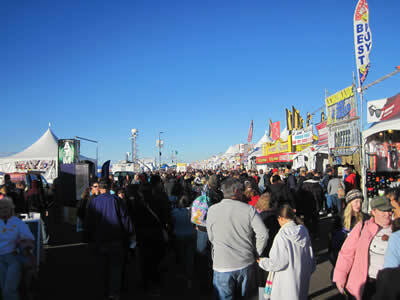 Discounts for families and groups were available but sadly, none for seniors or Balloon Fiesta RV park guests. The Friday evening event was actually two events. 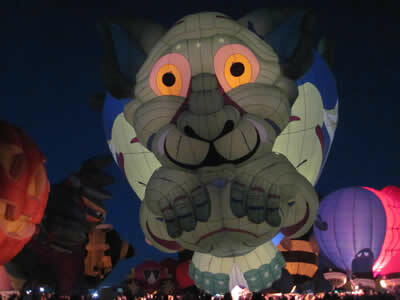 The first was called the, “Balloon Glow”. Hot air balloons can't fly at night so instead, they were inflated while remaining tethered to the ground. This may not sound very exciting but the sight of several hundred hot air balloons standing side by side in one area was nothing short of amazing. The “Balloon Glow” was one of the few opportunities for spectators to see and appreciate the many shapes and sizes of these lighter than air creations. Up close, they were enormous, a fact that’s hard to appreciate when they are floating hundreds of feet above the ground. Even the smaller, privately owned, sport balloons were taller than a three story building and wider than a typical house. The commercial and specialty balloons, those shaped to resemble items such as a Pepsi can, a humming bird, a Wells Fargo stage coach or Darth Vader were larger yet. It boggled the mind to think these vessels can actually fly. While the balloons were being set up, spectators were welcome to wander about the launch field, watch the balloons being inflated, talk to support staff and of course, take pictures. Albuquerque is one of the few (only?) ballooning events where this was and still is permitted. 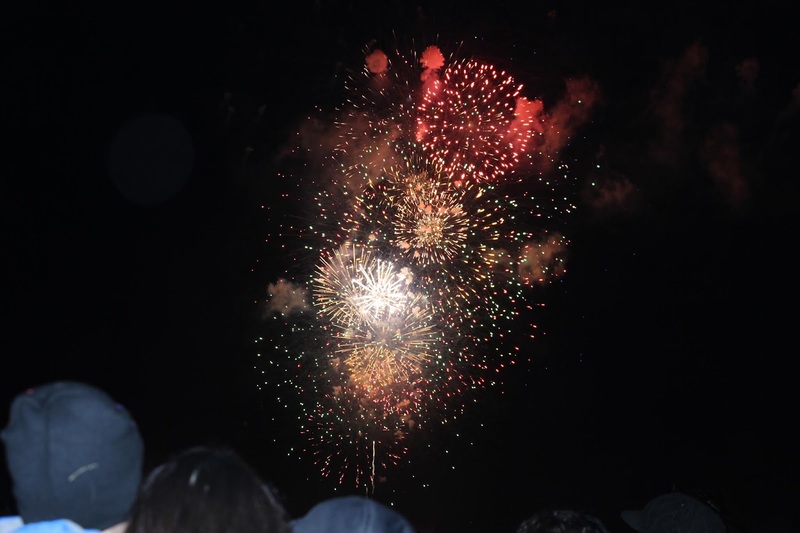 The “Balloon Glow” was followed by a second event called the “After Glow” - a spectacular fireworks display that lit up the night sky and seemed to go on for quite a while. Then, it was back to the RV and into bed because the following morning’s activities were scheduled to begin before dawn! The Main Event On Saturday morning, before the sun had risen, Maureen and I were back at the launch field watching the preparations for two of the most spectacular and perhaps best known activities of the fiesta – the “Dawn Patrol” followed by the “Mass Ascension” – hundreds of balloons taking flight! First up was the “Dawn Patrol”. 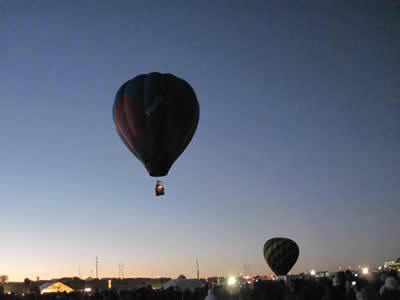 Approximately a dozen hot air balloons were launched just before daybreak and well before the others. Their role was to determine if conditions were favorable for flying as well as to gather information on wind speeds and directions at various altitudes. On this particular morning, conditions must have been good because it wasn’t long before the rest of the balloons were being readied for the main event - the “Mass Ascension”. The “Mass Ascension” involved hundreds of balloons ascending or taking off from the fiesta launch field. Even though the event is called, “Mass Ascension” the balloons didn’t actually lift off all at once. Launching that many balloons at the same time would have been incredibly chaotic and extremely dangerous. Instead, launches were staggered so that, at any given moment, about two dozen craft were rising skyward. Nevertheless, it was one of the most incredible scenarios imaginable. Beginning with just a few balloons, followed by a few more and a few more after that, the tempo swelled until the sky was filled with hundreds of brightly coloured, multi-hued shapes, floating majestically across the deep blue New Mexican horizon. Nothing – no words, pictures or even video - can truly convey the sense of awe and wonder that comes from standing in the middle of the launch field and looking up at a sky filled with multi-coloured, hot air balloons. It’s a sight that must be experienced to be fully appreciated. Initially, all the balloons seemed to be standing still however, it wasn’t long before they became widely dispersed across the sky. That’s due in part to a weather phenomena called the “Albuquerque Box” - winds that blow steadily from several different directions depending on the altitude. As a result, a balloonist can drift far to the south, climb to a higher altitude, catch a northerly flow and (in theory) land back at the launch field. During the week, balloon pilots actually used this phenomenon to participate in various skills competitions. For the “Mass Ascension” however, most pilots seemed content to land elsewhere. As with the “Balloon Glow” the evening before, spectators were welcome to wander about the launch field, watch the balloons being prepared for flight, talk to ground crew members and take pictures - thousands and thousands of pictures. That maybe why the “Mass Ascension” is said to be the most photographed event on the planet. All too soon, the magic ended and reality returned. For Maureen and I, reality included cold hands and icy feet which had been forgotten during the excitement of the Mass Ascension. Even though we suspected Albuquerque mornings would be cold, we failed to appreciate just how frigid the predawn temperatures of New Mexico’s largest city would be. Toques, mitts and lots of layers, weren’t enough to fend off freezing temperatures and prevent our extremities from becoming blocks of ice. Part of the chilliness stemmed from the city’s elevation. It was almost a mile high. Another factor was the weather. Skies were generally clear which may be great for balloon flying but not so great for retaining daytime heat. Thankfully, the temperature rose quickly once the sun came up. Albuquerque Fall Mornings Are VERY Cold. Hot coffee and warm sunshine were wonderful antidotes for frozen body parts. Before long, we were thawed out and ready to explore some of the other activities the Balloon Fiesta had to offer such as chainsaw carving and Balloon Fiesta pin trading. It was also a good time to visit the concession stands, souvenir booths and food vendors along the east side of the field in an area called “Main Street”. Anyone who has been to a carnival midway will feel right at home here. With Christmas not far away, it seemed like a perfect opportunity to pick up some unique gifts. Who wouldn’t treasure a Balloon Fiesta t-shirt or travel mug? 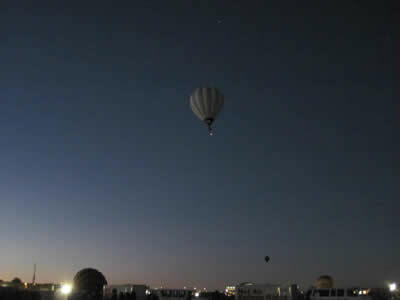 While there was plenty to see and do, on and around the launch field, the city of Albuquerque beckoned. It too offered a host of activities worth exploring. For example, the city boasted 19 museums, many focused on the preservation of Hispanic and Native American art and culture. In addition, hundreds of art galleries and studios offered a variety of fine art, authentic Southwestern jewelry, pottery and contemporary art. Many of the galleries were located in Old Town, a reconstructed plaza on the site of the first Spanish settlement, built in 1706. It was a wonderful area to stroll around, window shop and explore. 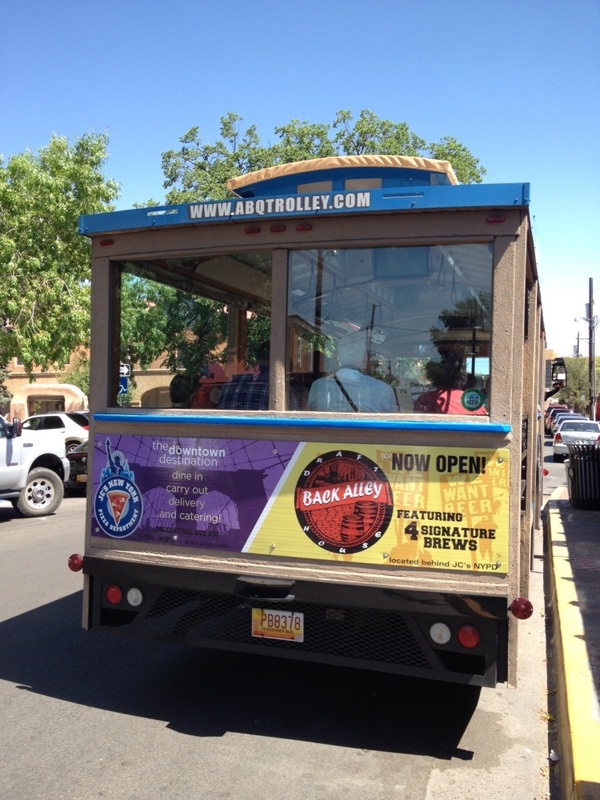 Old Town was also the departure point for ABQ City Tours - a trolley tour of the city. Generally, trolley tours are a great way to get to know the high points, interesting spots and historical landmarks of a new city and that’s true with ABQ City Tours however, the guide seemed to spend an inordinate amount of time pointing out locations used in the filming of the TV series, “Breaking Bad” which was great if you’re a fan, not so much if you’re not. Nevertheless, there was still enough interesting stuff of a historic or general nature to make the tour worth taking. 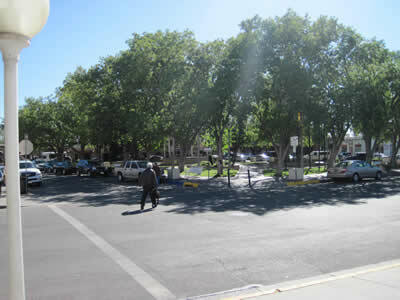 Route 66 Nostalgia Not far from Old Town is downtown Albuquerque which has undergone something of a revival thanks in part to Route 66 nostalgia. The main street was once part of the famous “mother road” and many of the shops and restaurants have preserved or revitalized their vintage look and heritage neon signs. To the north was the Sandia Peak Aerial Tramway, a cable car that transported visitors to the peak of Sandia Mountain, 10, 378 feet high. Maureen and I didn’t actually ride the tram but the tourist literature claimed that visitors had a 11,000 square-mile panoramic view of the Albuquerque area and Rio Grande river valley. 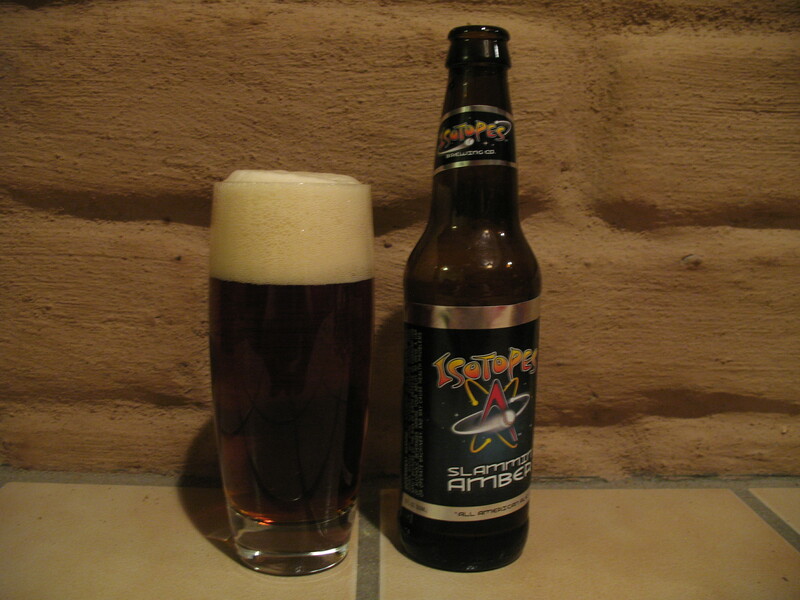 For craft beer aficionados, Albuquerque is home to an amazing creation called, “Isotopes Slammin’ Amber Ale”. Initially crafted just for the home games of the city’s minor league baseball team called the, “Albuquerque Isotopes”, production has increased to the point where it was available in select locations beyond the ball field. It was by far the best amber ale I’ve tasted and I’ve tasted a few. 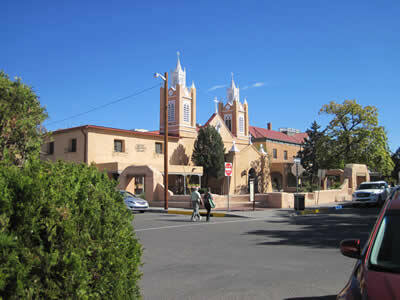 And, should the sights and sounds of Albuquerque grow tedious, the historic, artistic and very picturesque city of Santa Fee is just an hour’s drive up the road. The Albuquerque International Hot Air Balloon Fiesta was an amazing event and one that should not be missed. Few activities on this planet can evoke a sense of awe and wonder like the sight of hundreds of balloons floating gracefully across a deep blue New Mexican sky. It’s a bucket list must-do. For more information, check out the Albuquerque International Hot Air Balloon Fiesta website at: http://www.balloonfiesta.com . Not only is there a detailed schedule of each day’s activities and lots of other information, there is also a link to the RV park reservation area. In the next installment, I’ll share the story of our volunteer experience when my wife and I become members of a balloon support crew and learn more about the sport then we could have imagined.